Matomo Pull Request #14003 - Include non-sql migrations in update dry run output. It be nice to have all SQL updates grouped, and all other commands in a separate box. So it is easier to copy/paste etc. Wouldn't this potentially cause problems related to order? Ie, one update activates plugin OurNewPlugin, next update assumes it's there and applies SQL on a table it assumes exists. If run separately, the SQL may not succeed. The MySQL queries would always need to be executed first for sure. Not sure if we had ever an issue where it doesn't work because of activating the plugins afterwards? Of course people might mess up and activate plugins first. But then they would either get an error when trying to update or so, or it would work a little bit later as soon as the DB queries are executed. Unless on update the plugins add more DB entries into a table assumed exists in which it can fail for sure. The MySQL queries would always need to be executed first for sure. What I mean is there may be cases where an update assumes a plugin has been activated first, and executes SQL on tables that it assumes exists. Or that a plugin assumes a certain update has been applied and a table exists when installing/activating. In the first case, the plugin has to be activated first, in the second the SQL executed first. Migrations are meant to be run in order (as I'm sure you know), placing them out of order could create incorrect instructions. etc. 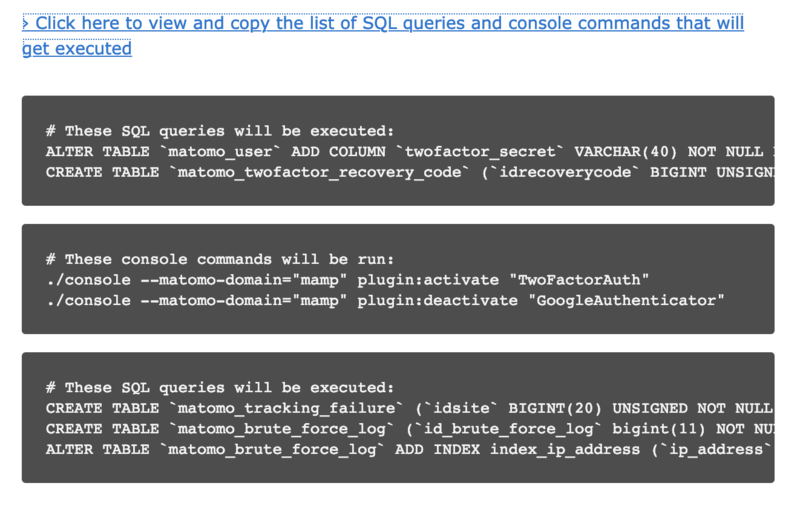 This way order would be preserved and we won't have users running the commands/sql improperly. Was thinking of the many boxes as well... especially since we don't often have plugin activates/deactivates this could be fine.